- Do you Want to Trim Faster? - Want a Higher quality design? GreenThumbPro is dedicated to delivering Quality products. And backed By A Life Time money back Guarantee too! Cannot Guarantee Special Pricing. Be sure to click Buy Now! REDUCE HAND STRESS: We know that pruning for long periods of time can take its toll on your hands. These scissors were made to eliminate the day to day stress that comes from long time pruning with our soft grip handles, sharp stainless steel blades and quick release spring. PROFESSIONAL DESIGN: Not only is our pruners durable and lightweight they are made with high quality extra sharp stainless steel blades, Soft grip handles for comfort and a quick release spring for ease of use. PERFECT FOR ALL TYPES OF GARDENING: These extra durable pruning shears are a must have for hobby or commercial growers who care about the quality of their product and prefer to hand trim their flowers. 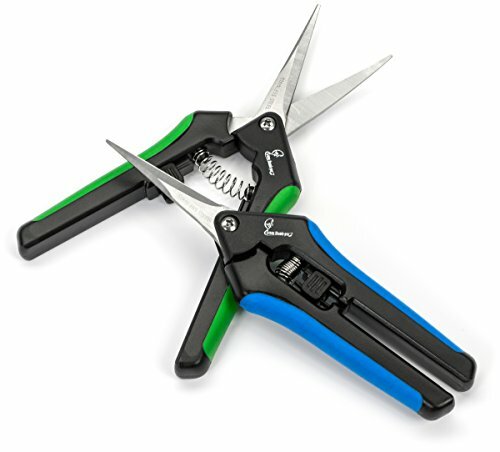 Whether your pruning stems, roots or trimming flowers we are confident that these scissors will get the job done. A MORE PRECISE CUT: Whether you are pruning your standard stems and flowers with our straight blade or need the perfect angle to reach those hard to reach areas with the curved blade, we got you covered. This duo of will get your plants looking beautiful and on point. If you have any questions about this product by Greenthumbpro, contact us by completing and submitting the form below. If you are looking for a specif part number, please include it with your message.